Life's Journey To Perfection: Family Home Evening- 1st Article of Faith and Wk 2 of Budgeting & Paying Tithing - Helping Children earn Money. Family Home Evening- 1st Article of Faith and Wk 2 of Budgeting & Paying Tithing - Helping Children earn Money. Happy 2014 to Everyone!! This is the first Family Home Evening of the Year. What a great way to start out the new year by making a resolution to hold family home evening every Monday. I know that life is crazy busy, but I know that if we make the time and put family home evening as a priority then relationships withing the family will be strengthened, the family will be stronger and they will be closer with our Father in Heaven. This year I am going to be focusing on an "Article of Faith" each month. I believe that a child is never too young to start learning the "Articles of Faith". I am also going to continue to plan some of my lessons around the "Faith in God" Booklet. I will be doing these the first Monday of each month. Some of my other lessons will be centered around cub scouting, the "Friend", the primary sharing time outline and whatever else I feel that my family needs at a specified time. I hope and pray that you can use these ideas as a guideline and adjust them to the needs of your own specific family. Our prophet President Monson says, "We cannot afford to neglect this heaven-inspired program. It can bring spiritual growth to each member of the family, helping him or her to withstand the temptations which are everywhere. The lessons learned in the home are those that last the longest." On Lds.org there are resources available in helping to make your Family Home Evenings successful, here is a link to that site on Family Home Evenings. The activity I have chosen from the Faith in God book for tonight's Family Home Evening is to "Learn how to budget and save money. Discuss why it is important to faithfully pay our tithing and how Heavenly Father blesses us when we do (see 3 Nephi 24:10-11) Pay your tithing and begin saving for a mission." This is week two on this topic. Article of Faith: # 1 "We believe in God, the Eternal Father, and in His Son, Jesus Christ, and in the dHoly Ghost." 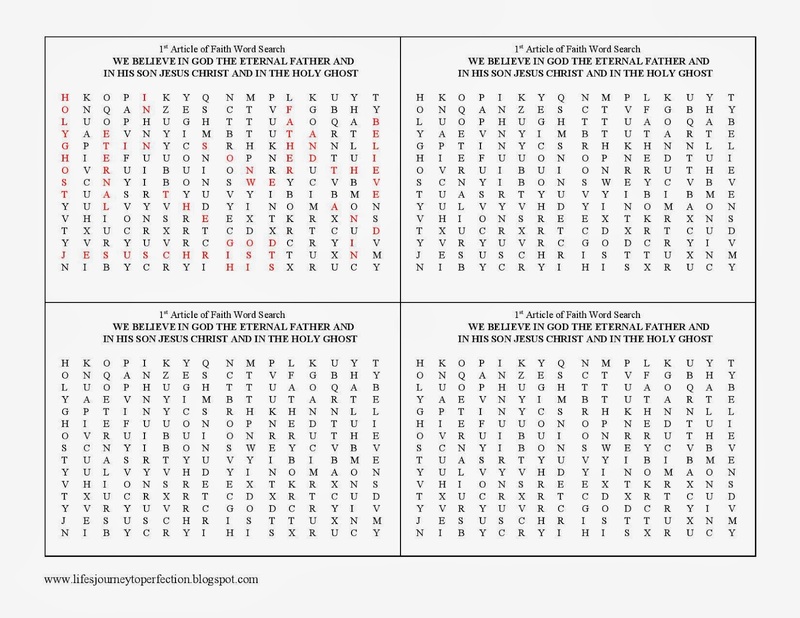 Give each family member a word search for the 1st Article of Faith. Here is a link to week 1 FHE on this subject. For our Family Night we are going to be focusing on our chores and chores for money, budgeting and tithing. Discuss with your family why it is important for each person of the family to contribute and do their chores? Some discussion might include that their is so much to be done that it would not be fare for one person to do all of the work. As a family works together to accomplish the things that need to be done then the family will be happier and run more smoothly. Discuss as a family why it is important to learn how to do hard things. Discussions might include an explanation of how life in general is difficult. But as we endure this hard things whether it be homework, housework, or challenges, we learn that we can do these hard things. We learn and we grow stronger and will be able to do even harder things. Discuss with your children what chores they will be expected to accomplish each day. Some of these chores may be for an allowance. As I said last week, my husband and I do not pay our children an allowance for their everyday chores. It is up to each individual family what they decide to do for their family. The following is what we are going to be do with our little family. The below one is what my children have on their door. It makes it so handy because they are able to look and see what they need to do themselves. They know that before they can watch TV, play their games, or play they need to accomplish their chores. I think this teaches them responsibility and accountability. I do not have listed on here but they are responsible also to bring their dirty clothes to the laundry room and to put their folded laundry away and hang up their shirts. 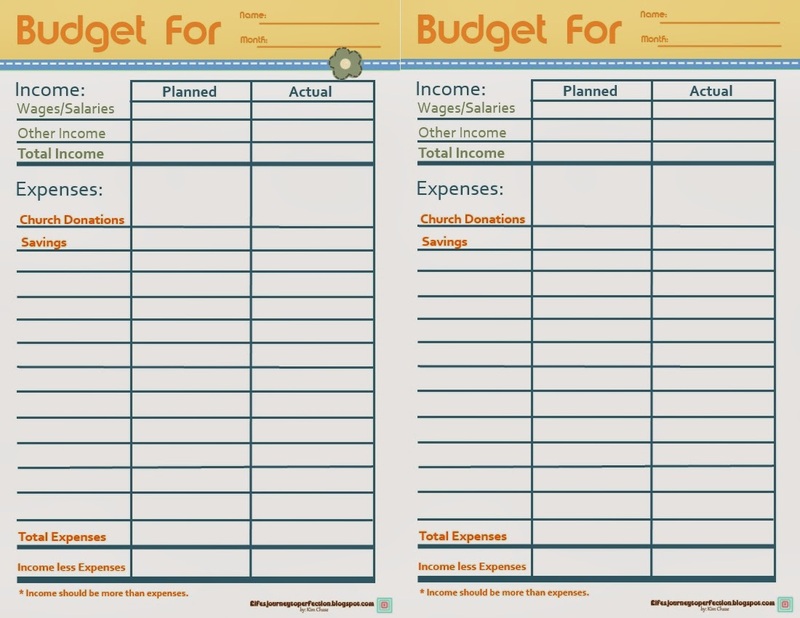 This is something new that we are going to start doing as a family to help our children to learning budgeting and be able to participate in paying tithing. I have seen other ideas out their of giving them fake payment that they can turn in for toys or privileges. That is great, we have chosen for our family to use real money. The reason for doing this is as I mentioned above is to help them learn about finances and saving and paying their tithing. 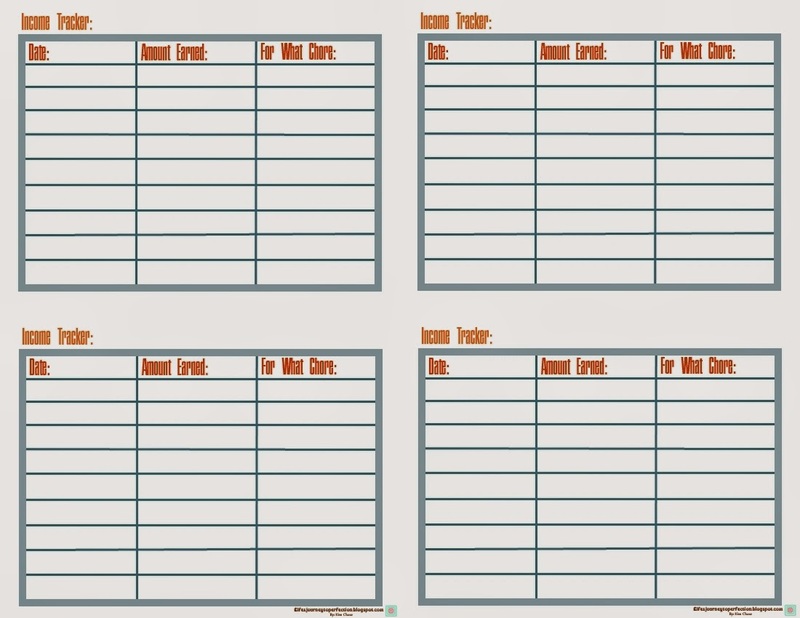 Print page 1(the chart) out onto card stock or photo paper. You will need to either type or write your children names in. I am going to probably either put it in a frame or mod podge it onto a piece of wood. I am planning on hanging this up in my home. Print out page two. Cut out all of the little chore options. 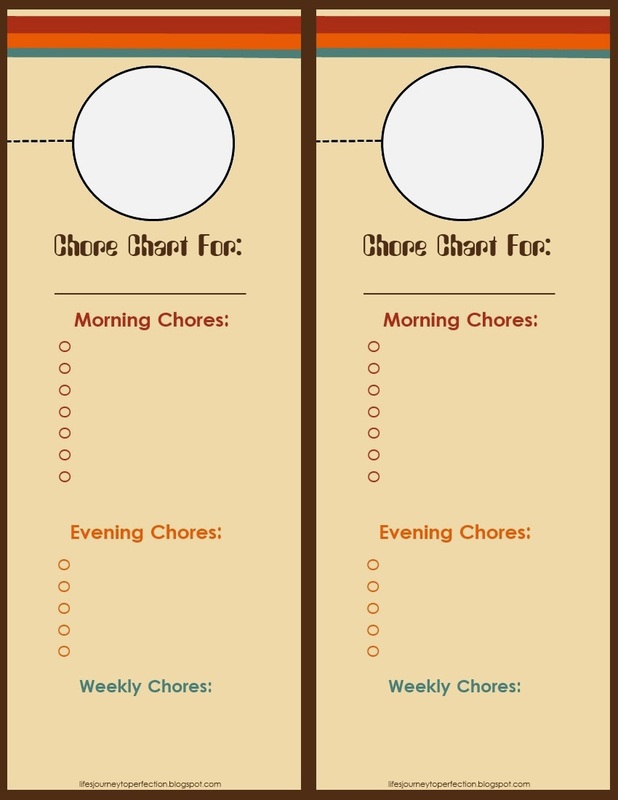 You will need to write your chores on them and the amounts you will pay for each particular chore. Then you can laminate them. 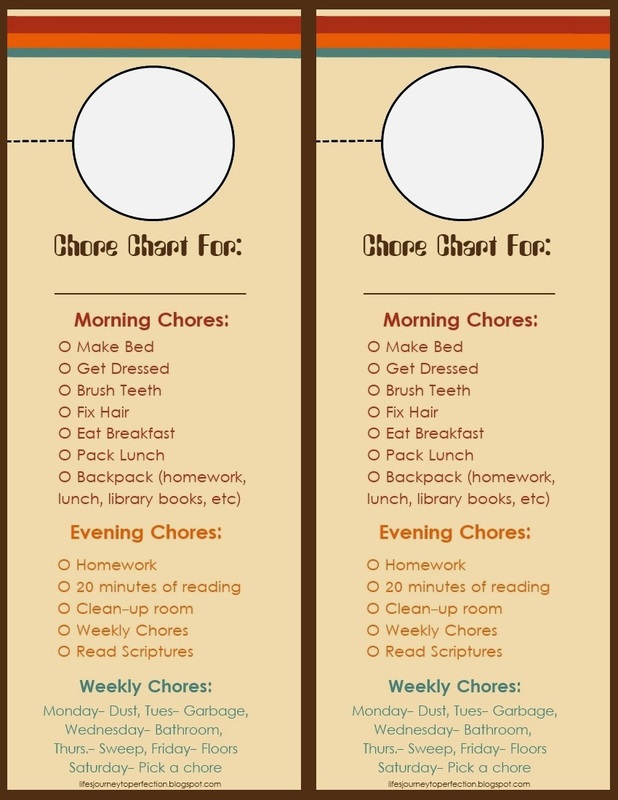 I think for mine I am going to laminate them and place a piece of velcro on the back of each and place the other piece of the velcro onto the chart down at the bottom where it says Chores for Money. Also, there will need to be velcro placed next to each child's name. So they can take the chore off of the bottom and place it next to their name. For my youngest I will allow him to do partial chores and his payment will be a partial payment (just because some of the chores are more difficult for him) With my children I am planning on letting them choose up to three of the Chores for Money jobs a week. Once it has been chosen it will not be available to be chosen again for a week. (I don't need the blinds dusted every day) At the end of each week (Saturday night). I will look at their chart and total up there jobs and give them their money/payment. Then those jobs will be pulled off and put back down on chores to do. 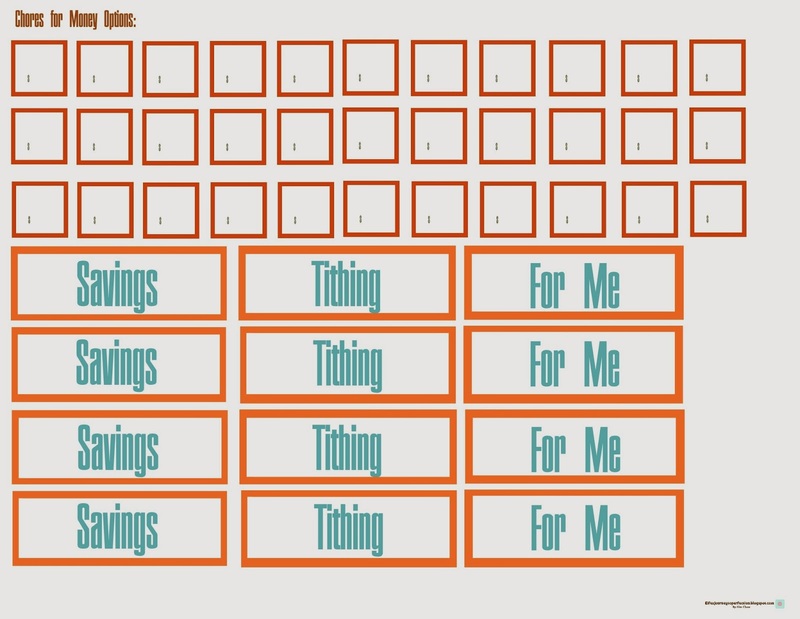 The labels: Savings, Tithing, and For Me. Will need to be cut out. These can be attached to envelopes, baggies or containers. It will be where they can separate their money out into what they are going to do with it. Go over the Budget sheet with them. Help them fill it out. 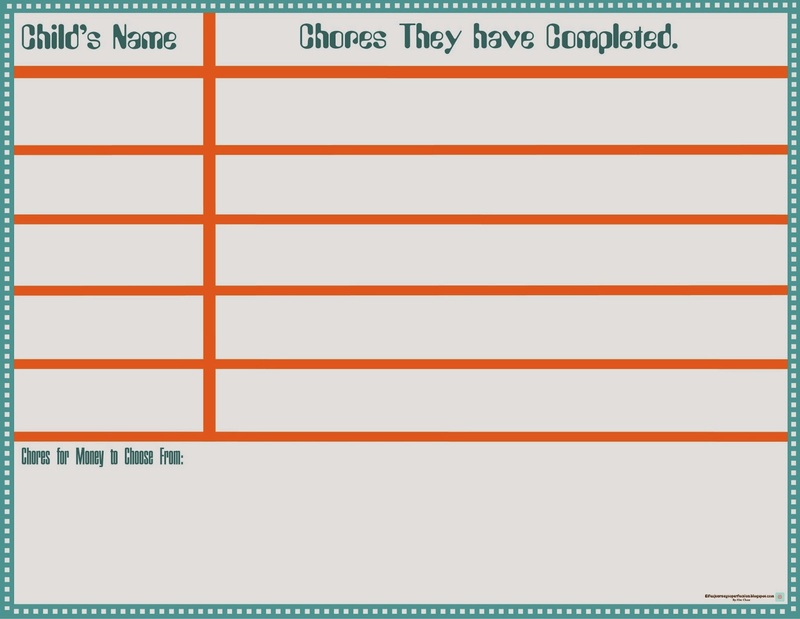 This income tracker can help the track what they earn after completing each chore. As they earn money, help them figure out how much 10 percent of their earnings are and then help them fill out their tithing form. Tithing forms and envelopes can be obtained from your bishop. A great object lesson on tithing could be to give each child 10 pieces of candy, such as skittles or even marshmallows and ask them to give you back 10 percent of what you just gave them. That would means they would only need to give you back one of the ten and they get to keep the 9. Bear testimonies on Budgeting, saving and tithing. I know this is an old post, but I just found it and love the FHE! I was curious about how you do your weekly chores. Is that the same for everyone each day - dust on monday, garbage tues, etc., or do they rotate what or where they are in charge of each day?